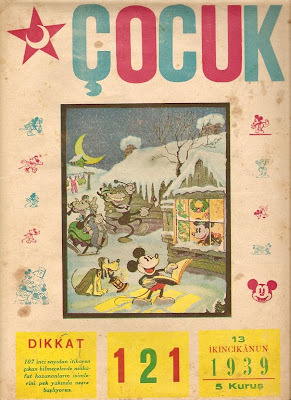 I give a break to my coverage of pre-war British Disney publications to post the above scan of the cover of a pre-war Turkish children's magazine which I acquired this weekend. It is no. 121, dated Jan. 13th, 1939, of Çocuk. The central color illustration is from the Disney Studio's Christmas/New Year's greeting card from 1931 (see post dated Dec. 5th, 2008 on vintagedisneymemorabilia.blogspot.com); if anyone can identify any other reprint of this illustration in any publication prior to its reprint in Turkey in 1939, I will be very grateful. The contents of the issue in question does not contain any Disney comics or stories. However, several other issues, from 1943, which I also acquired, feature Mickey Mouse strips. Çocuk was published by Dr. Fuat Umay, a parliamentarian who headed the public Children Protection Association. It is one of the very few (perhaps the first?) Turkish children's magazines based in Ankara, rather than in Istanbul.